BOOK DESCRIPTION: When young Robert Dudley, an earl’s son, meets squire’s daughter Amy Robsart, it is love at first sight. They marry despite parental misgivings, but their passion quickly fades, and the ambitious Dudley returns to court. I am still a fairly new devotee of historical fiction and have read a few books centered in the Tudor era but this is the first book devoted to Queen Elizabeth I and, more especially, Amy Robsart Dudley, a figure much lesser known and written about in history. The Queen's Pleasure is really Amy's story, told from her point of view as a young maiden desperately in love with the dashing Robert Dudley, transitioning to a blushing bride and then an unwanted and unloved wife, callously tossed aside for ambition. I loved Amy as presented in the book as much as I was frustrated with her - - although my frustration stems from Robert Dudley's shoddy treatment of her. It was very powerful to see through my reader's eyes the slow tearing down of a sweet, beguiling young girl, made into a fearful and suspicious woman who trusted no one. Even knowing her fate, I still hoped against hope that she would find happiness and the freedom she so richly deserved. Sections of the book are also devoted to Elizabeth I and I must admit that in the first chapter or so, outside the beginning of the book, I didn't like Elizabeth and thought her to be as cold and cunning as Robert Dudley himself. However, further chapters showed a more humane and caring woman, a woman desperate to serve her country and learn from her mother's demise. I found Elizabeth to be a bundle of contradictions - - guilt-ridden over her affair with Robert Dudley, but selfish enough to sustain the illicit relationship; claiming to love Robert while admitting that he was a scheming liar who betrayed his wife and, most horribly of all, that he may very well have murdered her or had her murdered. Those contradictions made her a fascinating character, a steely, strong-willed woman who felt she could never marry just a man as she was already married to England. Amy and Elizabeth were really two sides of a similar, if not the same, coin. Both were devoted in their own way to Robert Dudley, victims of his ambition. Both wanted nothing more than to be perfect in their expected roles - - Amy as Lady Dudley, Robert's wife and Elizabeth as a ruler to surpass her father. Both these women, as well as all others showcased in The Queen's Pleasure, are so vividly portrayed that I came away from this book feeling as though I had an inside track to Amy's thoughts and author Brandy Purdy took me to sixteenth century England as surely as if I had stepped into a time machine. The writing is inviting, intense and flawless, rich with the flavor of English country life as well as court life. The political machinations, the tragedy to befall the Dudley family and the mystery surrounding Amy's death were weaved to captivating detail and the end result is a mesmerizing work of historical fiction that puts Brandy Purdy on my "must read" list. I would not hesitate to highly recommend The Queen's Pleasure. It is what historical fiction should be. The Queen's Pleasure will be published in the U.K. under the title A Court Affair by Emily Purdy. 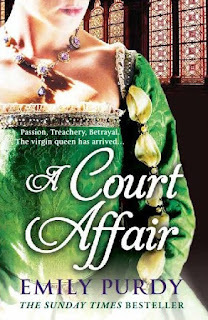 Brandy Purdy (Emily Purdy in the UK) is the author of the historical novels The Confession of Piers Gaveston, The Boleyn Wife (The Tudor Wife), The Tudor Throne (Mary & Elizabeth, and The Queen's Pleasure (A Court Affair). An ardent book lover since early childhood, she first became interested in history at the age of nine or ten years old when she read a book of ghost stories which contained a chapter about Anne Boleyn haunting the Tower of London. Visit her website at www.brandypurdy.com, you can also follow her, and her cat Tabby, via her blog at http://brandypurdy.blogspot.com or on Facebook as Brandy Purdy - Emily Purdy. With thanks to Historical Fiction Virtual Book Tours for including me on this blog tour!